ROTHESAY (AUS) (Bay 2006-Stud 2011). 4 wins-1 at 2, Queensland Guineas, Gr.2. Sire of 168 rnrs, 84 wnrs, inc. SW Too Good to Refuse (BRC Keith Noud H., L), SP Havasay, In His Stride and of Bring it Home Pop, Beloso, Kit de Luca, Jacksay - Fionesay (H.K. ), Oberland, Shadow Lawn, Shotacross the Bow, Iron Craft, Lauderdale, Natural Black, Raja Ampat, St Hilary, Venetian Beauty, Dumfries, Emeth, Extrasay, Halayr Rothestar, Hannah's Wish, etc. You Did What (g. by Real Saga). 6 wins-3 at 2-to 1400m, A$191,000, BRC LED Super Screens 2YO H., SCTC Summerveld Racing Stables H., BRC Farewell Eagle Farm Track P., Sky International H., 3d BRC AIW Printlink 2YO H., Stanley River Thoroughbreds H., Iona College Old Boys H.
Cobra Quick (g. by Rothesay). 2 wins at 1200m, 1400m in 2016-17, 2d SCTC Sommer's Fuel Supplies H.
Cool Brother (g. by Freeze). 5 wins at 1050m to 2016-17 in Macau. Engraved (g. by Rothesay). See below. Shobelle. 3 wins. See above. Silver Dane. 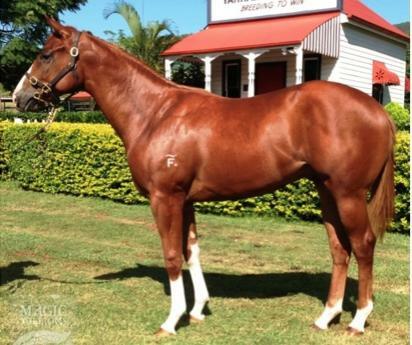 11 wins to 1200m, A$90,300, 3d QTC Brisbane Self Storage 2YO H.
Bludash (Canadian Silver). 4 wins from 1500m to 2200m, A$76,300, QTC Dux Hot Water H., Girl in a Million H., 2d Rockhampton Cup, L, QTC Seafood Restaurant H., 3d QTC XXXX Bitter H.
Finntorri. 2 wins at 2150m, 3300m in NZ. Pimpala Belle. Winner at 2 in Aust. Mehi Magic. Winner at 1200m in Aust. Producer. TENNESSEE BELLE (Tights). 3 wins at 1600m, 2000m, CJC Warstep S., L, 2d Hawkes Bay Opey Crystal P. Producer. Yabba Street. 5 wins at 1250m, 1500m, QTC W Glasson H., 2d QTC Asgard H., 3d QTC Royal Heights H.
POSTMANS DAUGHTER (Postponed). 9 wins from 1200m to 2200m, NZ$539,525, Counties Cup, Gr.2, Waikato RC Foxbridge P., Gr.3, Egmont RC Taranaki Breeders S., Gr.3, ARC Edwards Sound Chairmans Trophy H., JRA Trophy H., Counties RC Mondiale Freight Services H., ARC Titch H., 2d ARC Easter H., Gr.1-twice, WRC Thorndon Mile, Gr.1, BOP RC Japan-New Zealand International Trophy, Gr.2, Counties RC Auckland Thoroughbred Breeders' S., Gr.2, ARC Eagle Technology S., Gr.3, Te Hana Sparkling S., Gr.3, BOP RC Tauranga Classic, L, 3d BOP RC Japan-New Zealand International Trophy, Gr.2, Cambridge JC Travis S., Gr.2, Egmont RC Taranaki Breeders S., Gr.3, Rangitikei Gold Cup, L.
LORD WAVERLEY (Imposing). 10 wins from 1100m to 1600m, A$102,325, Qld Tatt's RC XXXX Mile H., L, BATC DJ O'Mara Graduation S., Queensland Draught Graduation S., 3d Qld Tatt's RC WJ Healy S., L. Sire. GOLDSCHATZ (Pins). 8 wins from 1600m to 2000m, S$679,030, Singapore TC Fortune Bowl, L, 2d Singapore TC Queen Elizabeth II Cup, L.
ANNIE HIGGINS (O'Reilly). 6 wins from 1200m to 2400m, NZ$294,175, Waikato Gold Cup, Gr.3, 2d ARC Royal S., Gr.2, Wellington Cup, Gr.2, 3d ARC Eight Carat Classic, Gr.2. MARY LAVELLE (O'Reilly). 2 wins at 2, CJC South Island 2YO S., L, Ashburton 2YO Classic. Producer. KAZAKH BELLE (Semipalatinsk). 7 wins from 1200m to 2150m, A$280,020, BTC Chairman's H., Gr.3, 2d GCTC Prime Minister's Cup, Gr.2, BTC Chairman's H., Gr.3, 3d BTC Doomben Cup, Gr.1. Producer. WONDER DANCER (Danzatore). 6 wins-2 at 2-from 1200m to 2400m, A$756,990, VRC Sires' Produce S., Gr.1, WATC Australian Derby, Gr.1, NSW Tatt's RC Roman Consul S., Gr.3, Pinjarra RC Millionaire Sires' S., Gr.3, VRC Carbine Club S., L, 2d VATC Sandown Guineas, Gr.2, Merson Cooper S., Gr.3, Newcastle JC Penfolds Classic S., Gr.3, VRC Myer Fashion S., L, Pinjarra Guineas, L, 3d AJC Sires' Produce S., Gr.1, Newcastle JC Spring S., L. Sire. Race Record: 7 Starts 0-0-1 A$4,200.